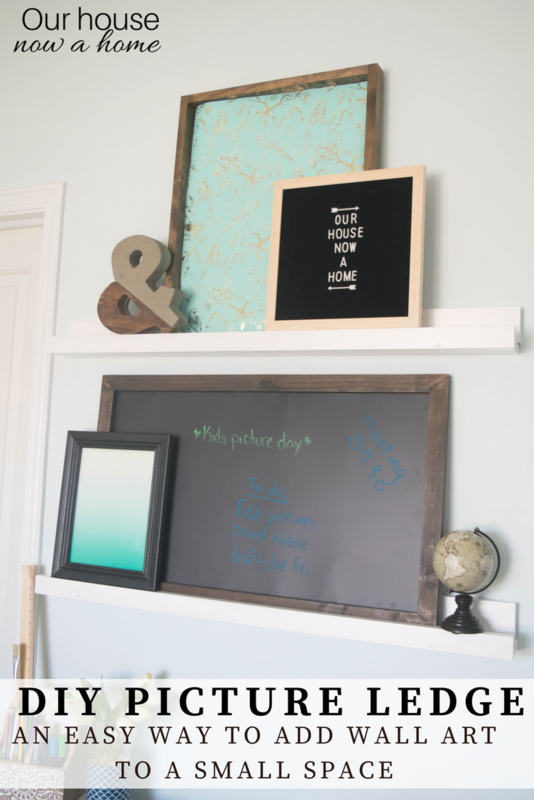 DIY picture ledge, adding wall art the easy way! Dealing with a small space in a home can be difficult. Combining that space into two or more functions, like a home office and a bedroom is even more difficult. 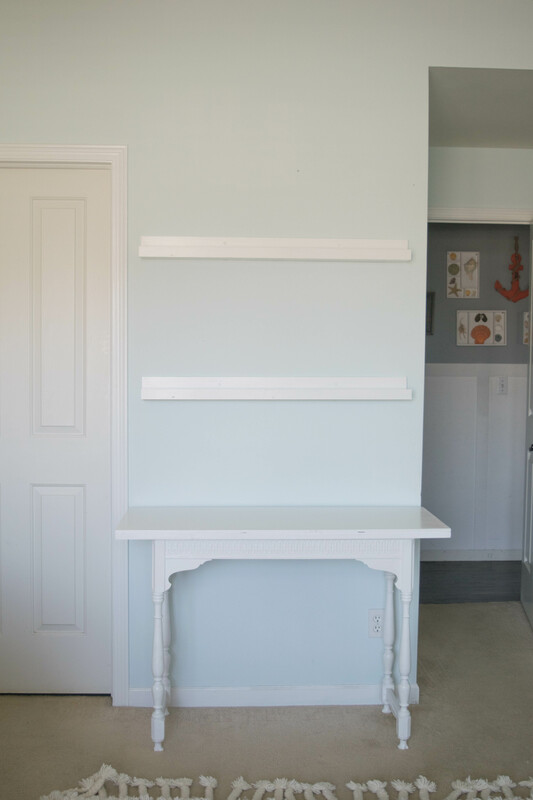 Creating it to be stylish and functional brings up a whole bunch of issues, but I got around a lot of these with this DIY picture ledge, adding wall art the easy way! Last week I revealed my tiny office space, squeezed into a 3 feet wide wall space in an area of my bedroom. It is a big time traffic area that needs to be organized and functional for me to be productive. 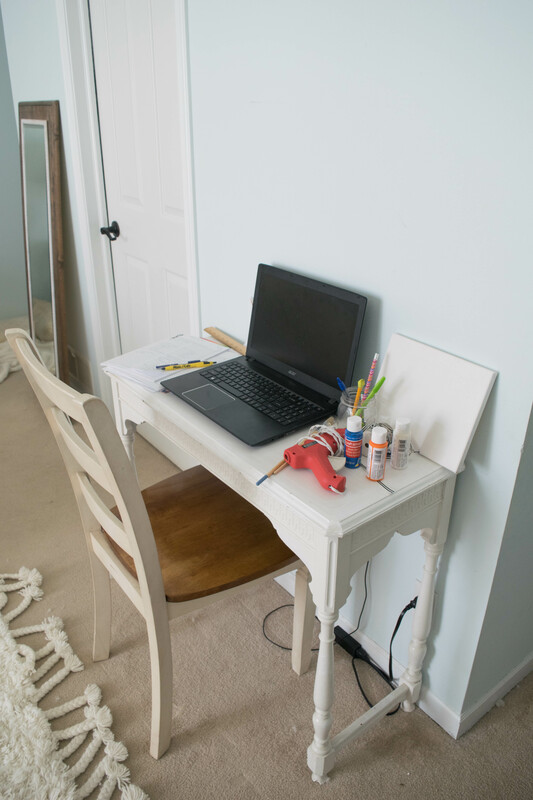 I shared how I decorated the work space, changed the desk with a small DIY addition and now I am sharing how I add some much needed style to my small office space. 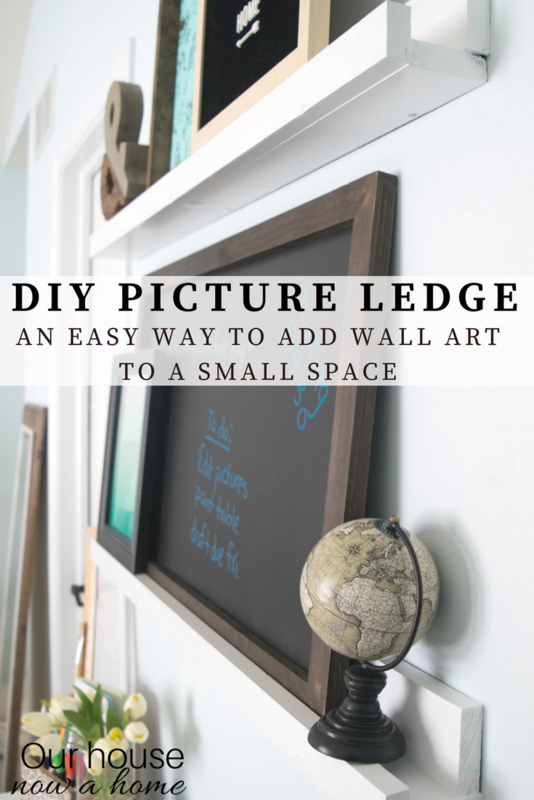 Creating a DIY picture ledge is actually really simple and straight forward. Let me explain why I chose to create a picture ledge instead of just hanging one or two pictures for this space. 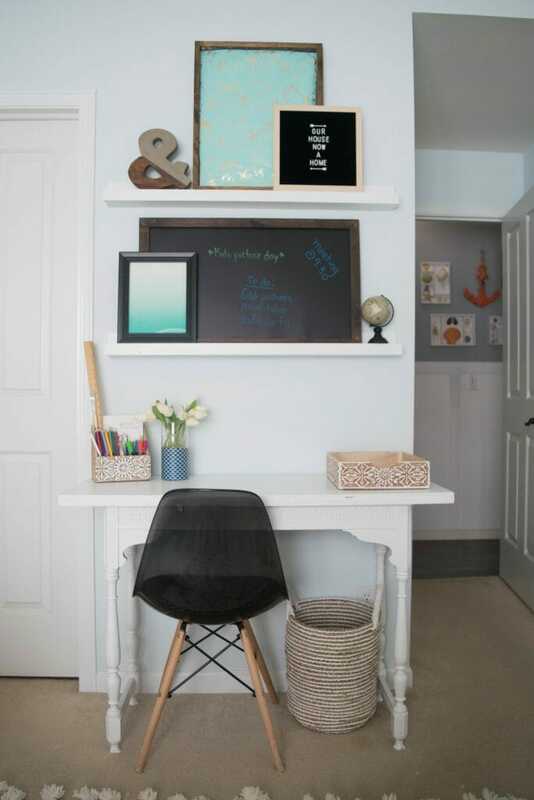 This little work space of mine needs to first and foremost function, so adding the picture ledge allows me to layer in functional wall items like a chalkboard as well as encourage the “style” side of this space. 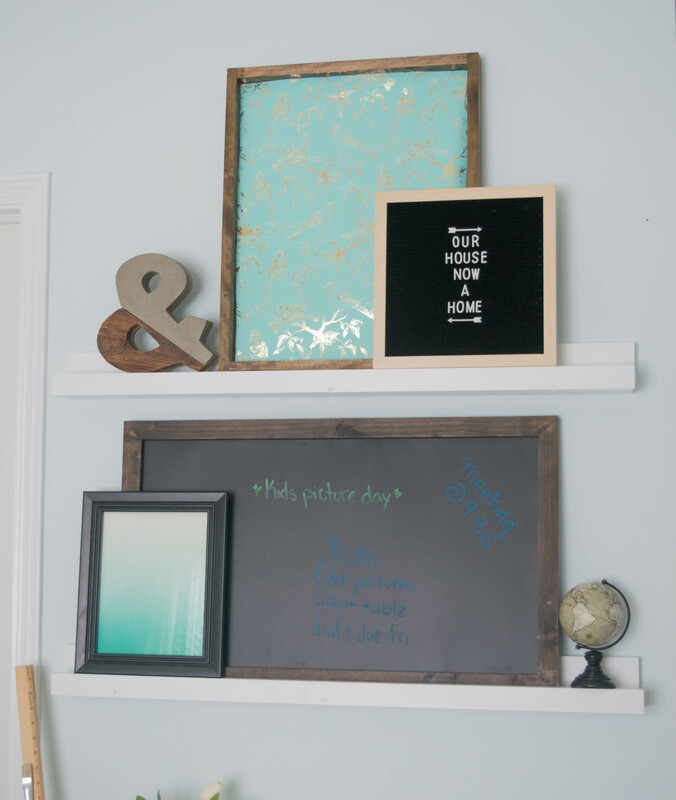 For this DIY picture ledge to work best it needs to be with at least two, for aesthetic purposes they work best in pairs. 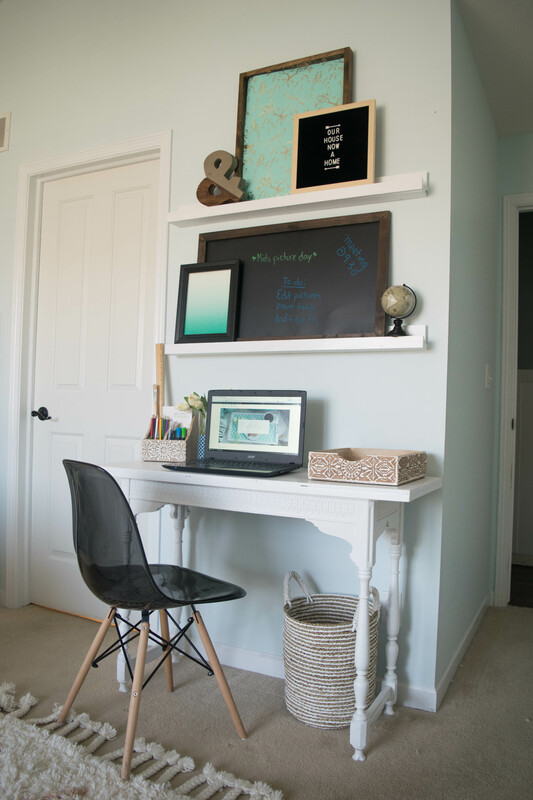 Choosing the wall space that a picture ledge will go is just as important as making it, putting them on a smaller wall like the one in my bedroom allows for the biggest impact. On a large wall they can feel too small for the space, unless you are going big and bold with a really long picture ledge. I purchased four 3 ft. long boards that are 2 inches wide. And two 3ft long boards that are 1 inch wide. The two wider ones will be the back and bottom. And the smaller width one will be the front ledge. The finalized picture ledge will be a square U shape, with the lower or smaller board towards the front. I chose a pine, with no finish. 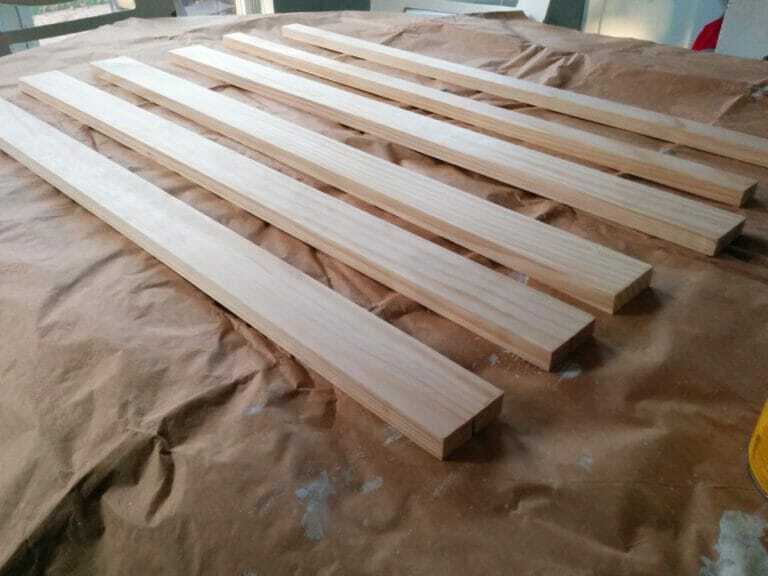 If there is a finish on your wood be sure to sand it up before the wood staining or painting begins. 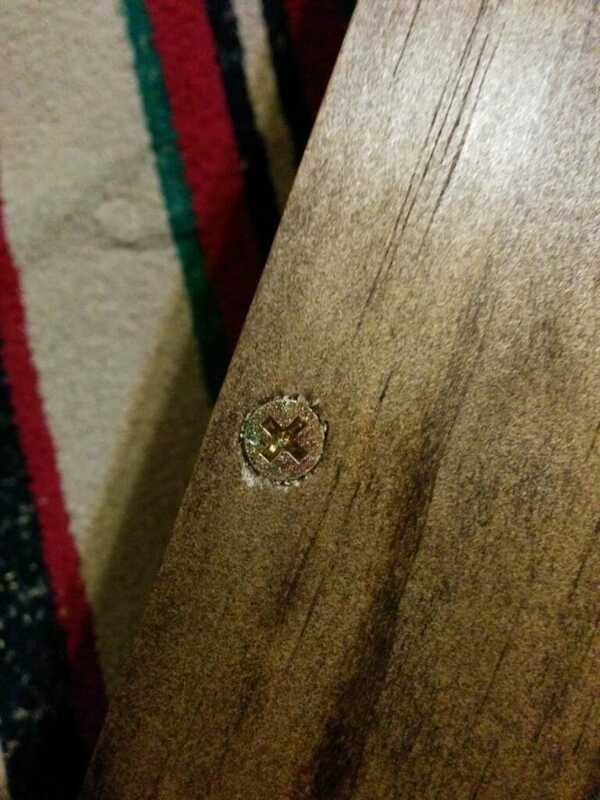 To connect the three pieces of wood together. I set up the two larger ones into an L shape. Then using a drill to make a hole in the wood. I used three to connect them all together. Making the hole first was best to make the screw go in easier. 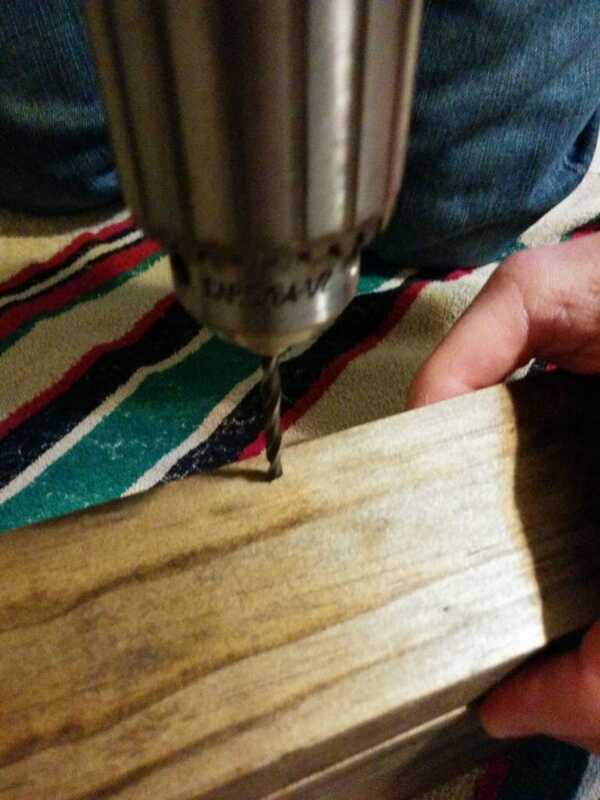 The screw can now go into the hole and not split the wood. The hard part of creating the hole has already been done. With the first two boards attached, then attach the same way with the smaller front ledge. You can either use wood glue or screws. I did not have any clamps to hold the ledge in place so wood glue was out for me. But the front screws really blend into the wood and are not seen at all. Spoiler alert, these pictures are a little weird because I actually made these a while ago with a dark wood stain. They were meant to go in a friends house, but it ended up not working so they have been in my basement waiting for their time to shine in my home. So the next step is a little wonky, I painted these white after they were put together. 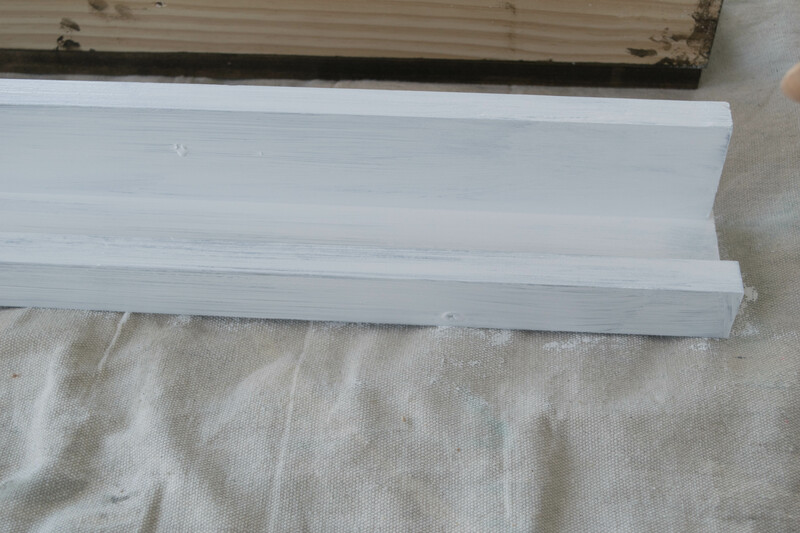 If you are making a DIY picture ledge paint or stain them before nailing them together. A nice clean coat of white paint it what is needed for my small office space. 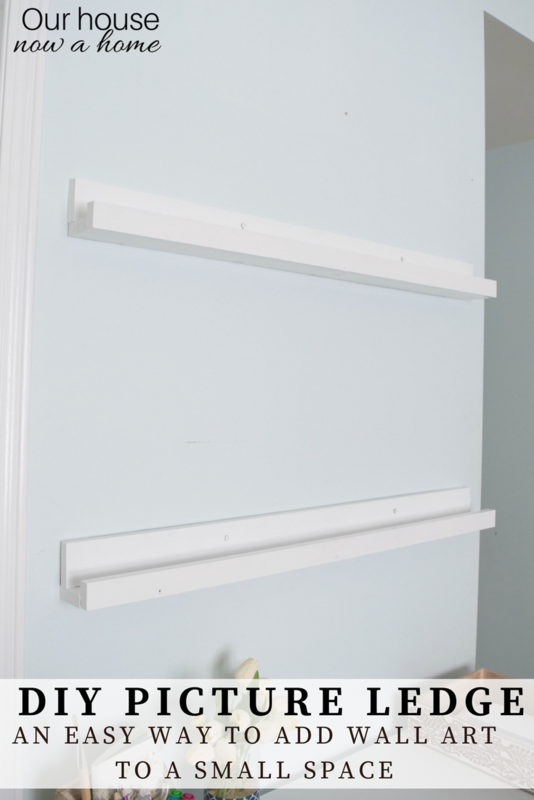 I attached the picture ledge to the wall by using two screws in the back into the wall, really simple. If you plan to have heavy things displayed on the picture ledge putting in dry wall anchors or finding a stud to screw in will be needed. I added quite a bit to my picture ledge using no anchors and it is holding up fine. As you can see, it was a really simple L shape with a front ledge. 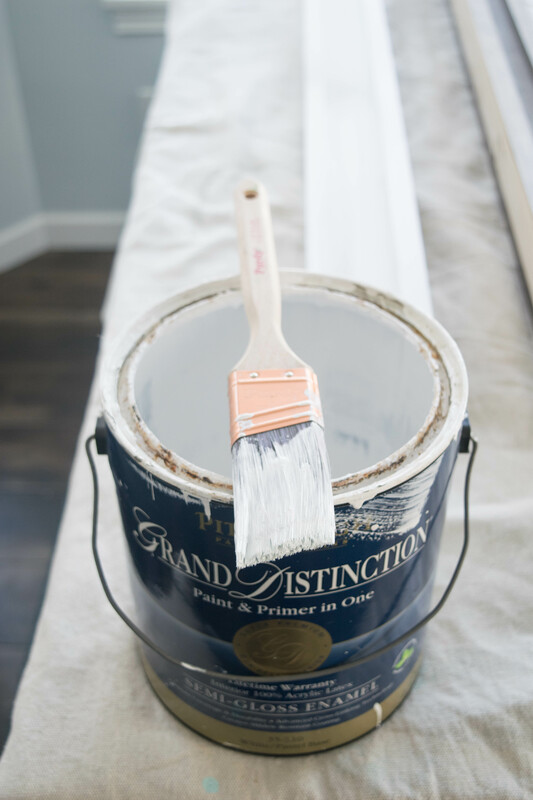 When staining or painting the wood be sure to turn them over and paint both sides and the edges. Since you get a view from all sides compared to a standard shelf. With the picture ledge here I am able to decorate my space, but still keep it uncluttered. Allowing my work space to be functional, which is the real goal when working from home. I am the type of person that is influenced heavily by her surroundings. 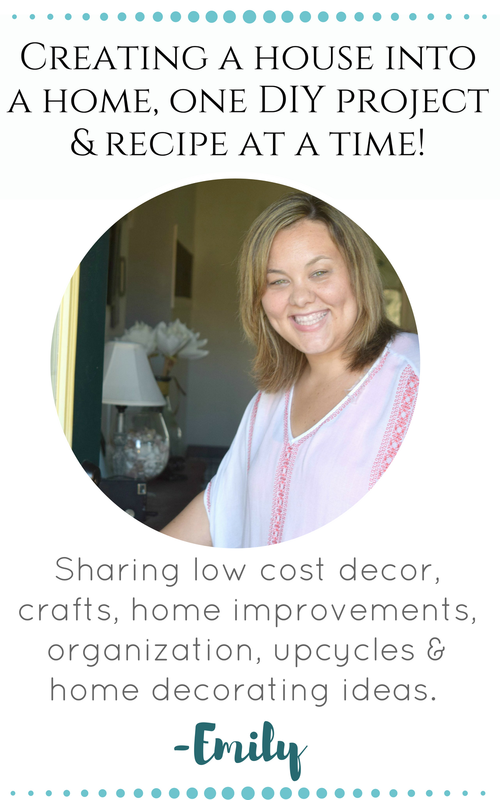 If I am working in a cluttered or disorganized room I have a difficult time being productive. So keeping things organized really does make a big difference for me. When adding the pictures and accessories for a picture ledge have fun with it. The wonderful thing about them is you can do a little more then just a gallery wall of pictures. 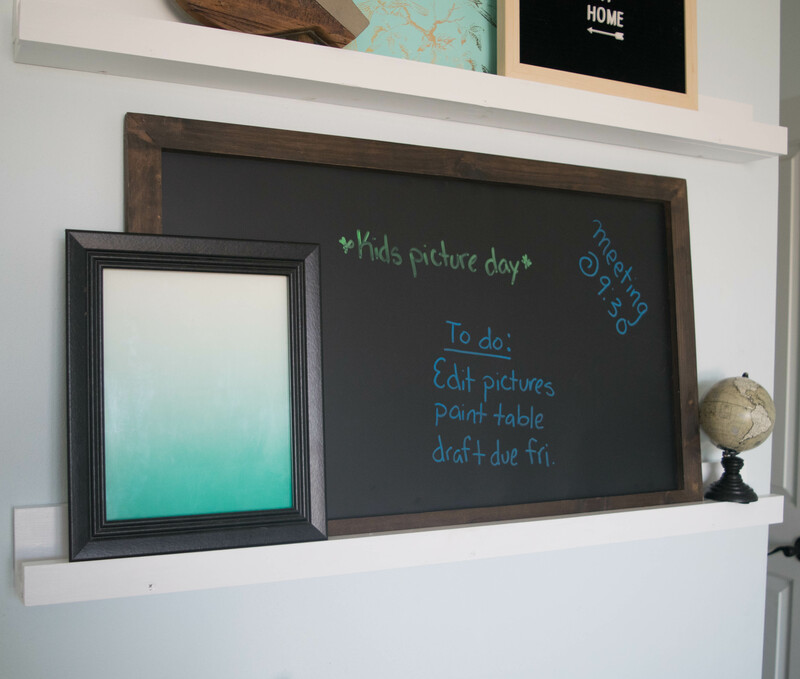 Layering the pictures in pictures, smaller decor items and even a chalk board was the sweet spot of blending the style and function I was going for. Once the ledge was screwed into the wall I just painted over the smaller screws with the same white paint. 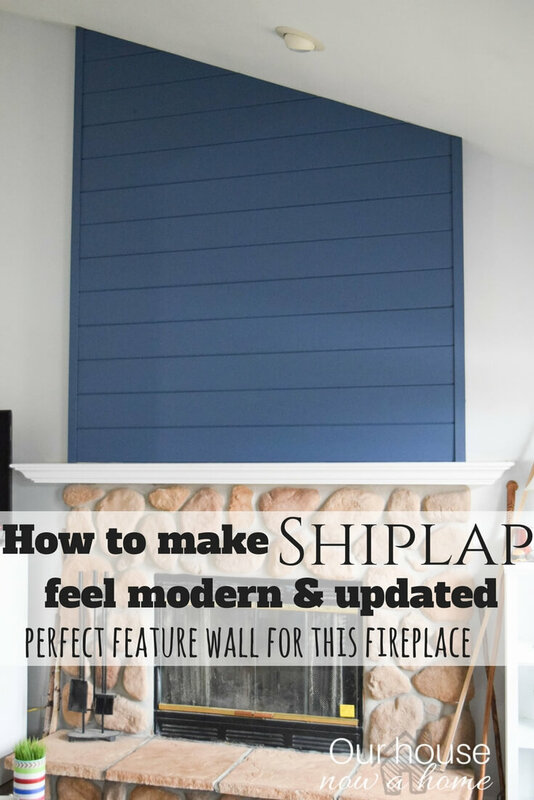 They are still visible but do not stick out or affect the overall look of the wall decor. I chose to go with white for these because I knew that the chalkboard would be a very dark color. I also added other decorative accessories with a deep wood stain, so keeping the picture ledge light and bright with the white was a way to off set the dark colors. It also makes the space feel more modern and less farmhouse or country. Not that there is anything wrong with that style, just not what I have in my home. Guys, seriously… adding the chalkboard has been amazing! 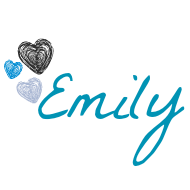 I was working on a campaign and there was specific sharing rules and hashtags I needed to use. I was able to write them down quickly on this and have it as a reference while I worked. No more sifting through random papers to find my notes, or sending myself yet another email that will clog up my inbox with notes for a blog post. This project took maybe an hour, including paint drying time. 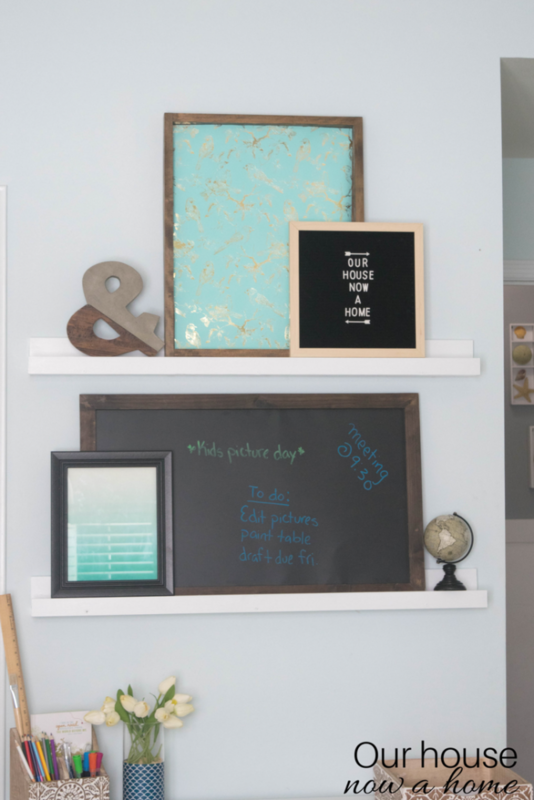 The DIY picture ledge, adding wall art the easy way is such a great way to add wall decor to your home. I adore the look of layering in the art and smaller decorations. It gives a stylish visual without taking up too much space. 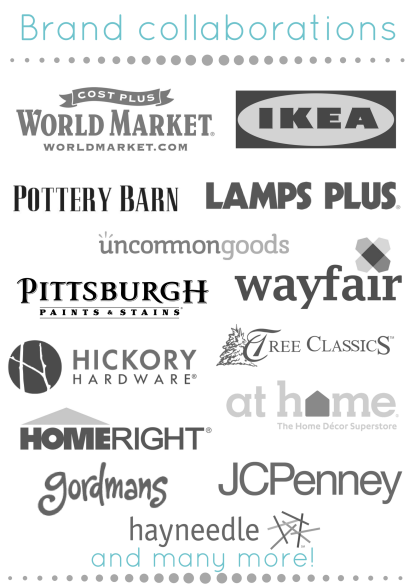 By doing it DIY style I can customize this to be perfect for my home and needs. Now, I finally have a work space that i can write and create in. I have found a way to mesh the functional needs of my office with my bedroom and it’s existing decor. Next week I should finally have a big reveal for my mini bedroom makeover! 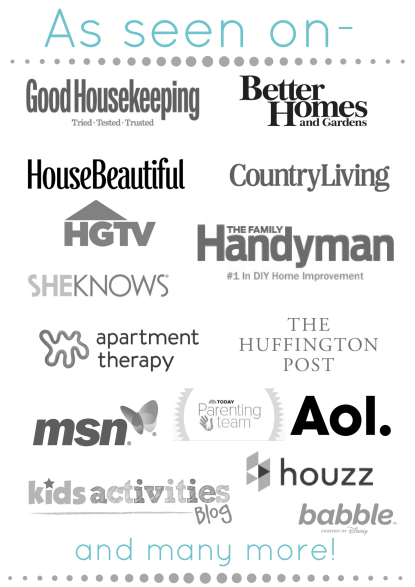 These are easy to make and install. Just have to be careful about perching items on the shelf. Near a door or open window. Sometimes things will fall. That’s a great idea for folks that don’t want to hang the pictures on the wall. And it would keep pictures and things nice and level, which is a challenge for some. I love how this turned out. I need to do this. We have so many photos that I want to display. I totally agree with you that working in a cluttered space keeps me from concentrating. 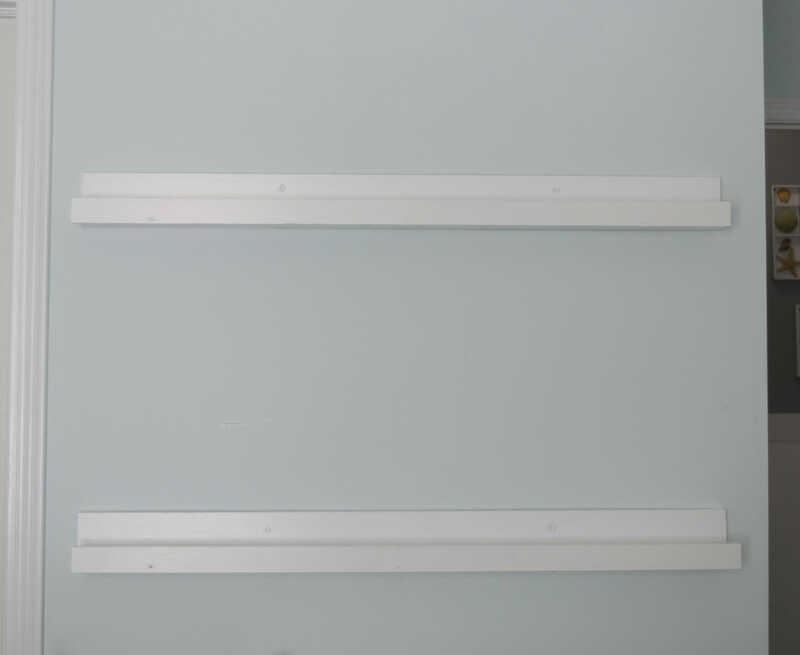 You new picture ledges are perfect for your space. 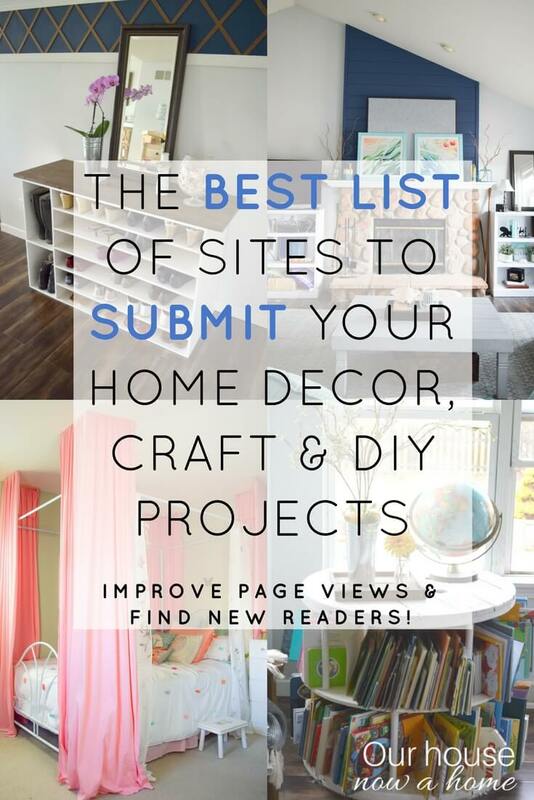 I could put those to use in my craft room too. The white matches your desk too. These were such a clever way to add function to a small work space! 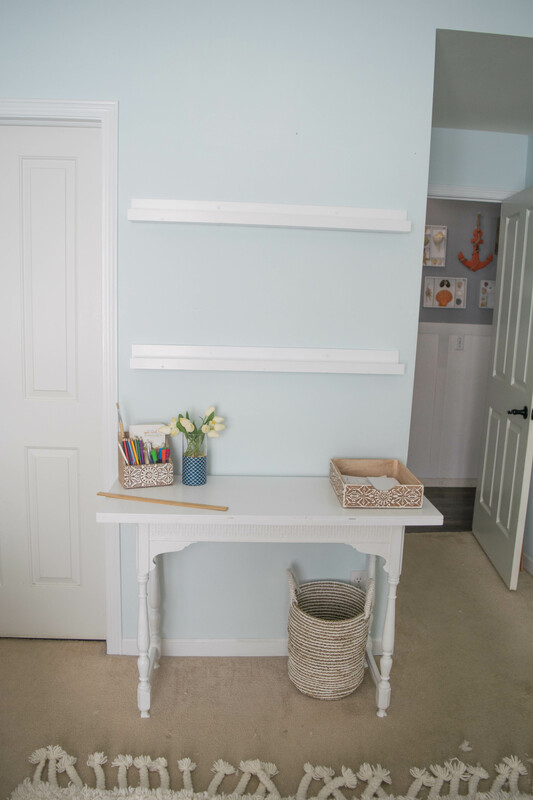 Such a cute and clever way to add space for your art, etc. I love that you could store your planner there, or other favorite collectables. Super cute. That is such a great idea. I need to go vertical in my son’s room. He’s got limited room and a lot of stuff. I need to put up some shelving in my kids’ rooms. I never thought about making them myself- duh!! I love how this turned out! I have a small blank wall in our living room, that I just can’t seem to figure out what to put there. I believe that this would be perfect! Wow that ledge really added ore space to the area! 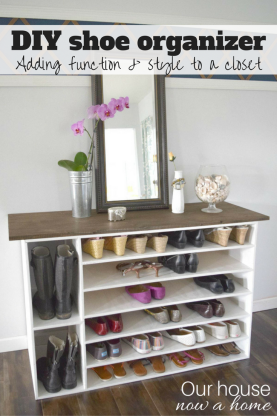 Dealing with a small space can definitely be hard but I love this little DIY solution. Turned out great! Here’s a tip – instead of using a ripped board for the front, pick up some inexpensive trim molding. It’s paintable and looks even more professional! Yes! I had commented on your tiny office space post about how much I love this idea! Thanks for DIY instructions! What a creative way to maximize your small office space. I am REALLY enjoying following along as your office space comes to life. Keep sharing. This is such a great idea. Way better than having to drill all the holes to hang individual pictures around. I like this picture ledge! This is a better way to display photos around the house. I like that you also put a chalkboard there. Awesome idea. 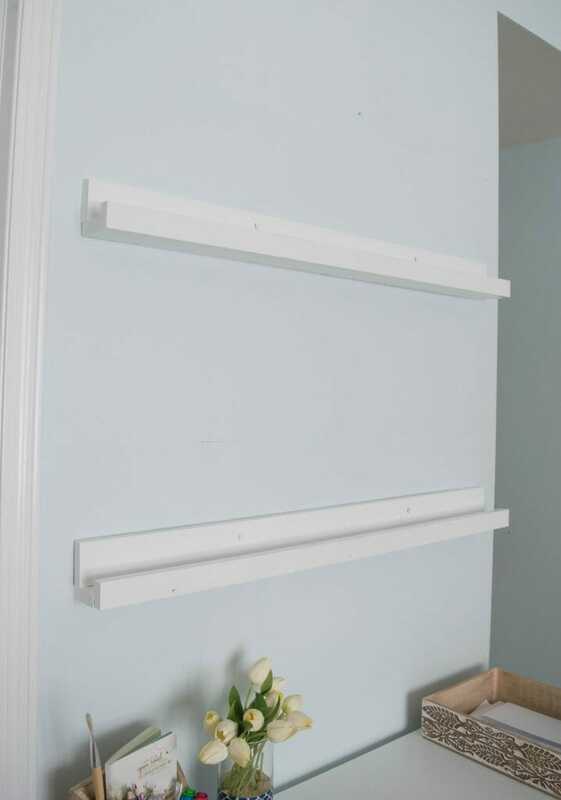 These shelves are super cute!! And they look easy enough to DIY myself!! YAS!!! We had read your earlier post about how you set up a small office space in your bedroom and had decided to take a few pointers from there as we too are thinking along those lines. Now, this is some more information for us to give a thought on. Very nice idea. 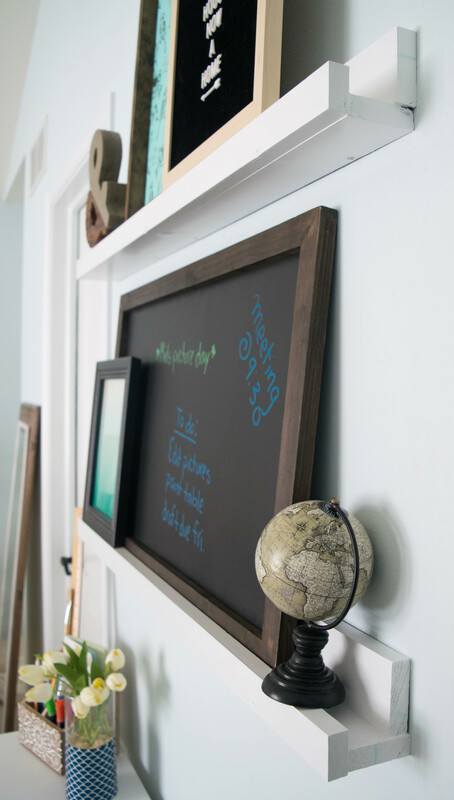 A room will certainly look better with these ledges on the wall coupled with the things that make you happier or remind you of a remarkable place or a milestone. This is such a great idea! We live in a small space, so I can so understand the space issue! That is a really simple project. It looks fantastic! That is a very nice re-purposing project. A nice desk is always a good idea! Such a nice make-over! Plus the advantage of this is that you save space and yet you give color to your working space as well. Pretty much gives motivation to work. Such a great clever way to add space fort things you love! I also love that you could store so many things in there!